Coach Steve Tandy accepts Ospreys' hopes of qualification for the European Champions Cup are all but over after losing 25-16 to Scarlets. The Swansea region lie ninth in the Pro 12 table - 12 points adrift of the top six with four games remaining. With Scarlets almost guaranteed a place in Europe, Ospreys need to break into the top six to stand any chance. Asked if the European hopes were over, Tandy replied: "I think so, there's not many more nails can go in the coffin." "But the true test of our character is how we front up now in a time of real adversity. We want to win games - there are four to go and we want to win them all." Ospreys face another Welsh derby against Newport Gwent Dragons on Friday, 1 April. In the Pro12, each of the four competing nations is guaranteed a team in European domestic rugby's premier competition. There are another three places based on league position, irrespective of which country the teams come from. As the table stands, Scarlets would be Wales' only representatives in the 2016-17 season. 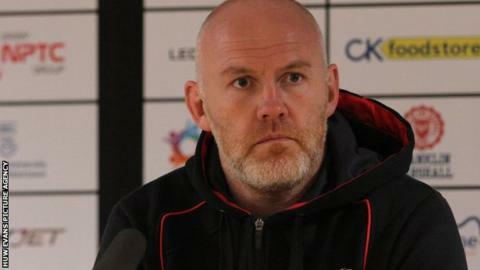 Tandy said Scarlets deserved their win. "We've gone into a lead early doors and we've let it go a bit too easily," he said. "It was a nip and tuck affair and the Scarlets have given that little bit more and got what they deserve."